Though Kentucky's Creation Museum aims to enlighten those "Perplexed by continual 'millions of years' stories'...with a biblical perspective on 'ape-men' ... 'evolution', dinosaurs, the origin of life...", it features a “walk through history” that ends on Satan's doorstep in a planetarium from Hell! Parents beware ! Beneath this Planetarium Of The Apes, Satan twitches his claws. 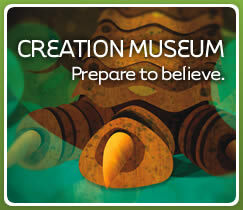 Why would a Bible-believing family museum want to shanghai innocent children onto a "starship ride billions of light years away ? " The BCC Theory Of Everything applies the rigorous equation D=2R to the scientifically impeccable premise that it takes light a year to travel a light year. As the radius of the Universe R, equals the number of light years since Genesis: ~4004BC+2007AD =6,011*, the B.C.C.T.O.E. concludes that surely as Numbers follows Leviticus, The Universe must be 12,022 light-years across ! Adamant's B.C.C.T.O.E. is 100% inflationary ! As light zaps outward from the formerly dark face of the waters here in Creation's center, the universe grows one light year larger every six months like clockwork. This assures the theory's endorsement by pro-watchmaker peer reviewers at The Discovery Institute, The Rush Limbaugh Show, The Weekly Standard, and quality NewsCorp science journals from coast to coast. The Good News about light taking just 12,022 years to traverse the the whole shebang is that volume of The Biblically Correct Universe scarcely exceeds a trillion cubic light-years. The wonderfully modest cube root of this figure puts the stars only one thousandth of a light year apart-- just a billion miles or two, making interstellar travel a present reality, as every space probe launched since Star Trek The Movie must by now have left hundreds of stars astern-- proof positive that Almighty Providence approves of NASA's 'Faster, Better, Cheaper' program. The solar system's accelerating capture of new stars should facilitate missionary efforts by Scientologists, Latter Day Saints, and Evangelicals alike, and abash those who blame the sun for global warming --the real culprit is plainly the superabundance of variable stars in the neighborhood. Who needs CO2? With ten trillion stars closer to Earth than Proxima Centauri, new supernovae appearing hourly in broad daylight should precipitate global warming of Biblical proportions. While the results of applying the virial theorem to the BCCTOE universe are too scary for publication in a family oriented blog, Discovery Institute astrophysicists may wish to do the dimensional analysis for themselves. * Not counting the Year Zero, which, being non-existent, is hard to subtract. Taking the cube root would be a good scientific guess for the average distance between stars, but is not the Biblical way. 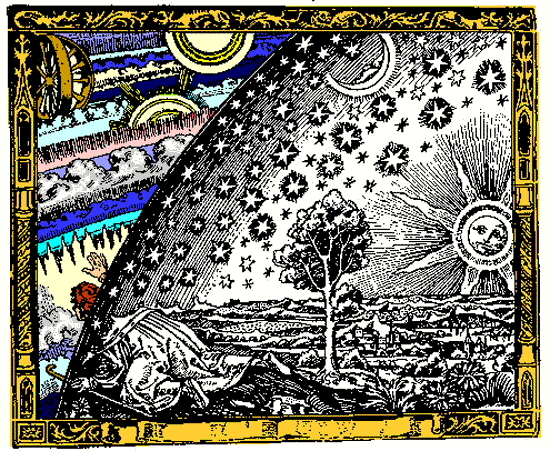 You forget that the stars are all pasted on the crystalline spheres, so your calculation fails. Foolish Bad Astronomer - Fig. 2 in my paper clearly shows the 8th crystalline sphere perforated with N holes, where N = the population of the main sequence, whence the stars have been blown inward by the aether rushing in to provide the vacuum energy driving cosmic inflation as the BCCTOE predicts. A metric standard graduate student has been inserted for scale in the figure's lower left. Thanks for the post. I laughed pretty hard. Then I took it upon myself to expand on some of the limitations of Young Earth Creationism. Particularly how we would percieve light from the universe if the world were created in the order set out in Genesis. My trackback isn't working but you can click on my name and get check out the post. Good God this is so funny, and yet so sad. I hope nobody actually believes this inane drivel. "The wonderfully modest cube root of this figure puts the stars only one thousandth of a light year apart-- barely a billion miles, making interstellar travel a present reality, as every space probe launched since Star Trek The Movie must by now have left several hundred stars astern"
...or said probes still haven't left the Oort Cloud yet. "With ~33 trillion stars closer to Earth than Proxima Centauri , the hourly appearance of new supernovae in the daytime sky may supplant CO2 in causing fear of global warming of Biblical proportions." So 33 trillion stars are closer to us than the closest star? Perhaps you should pick up an Astronomy book at a used book store, or even take Astronomy 101 at your local community college. The Sun's temperature is approximately T = 5800 K. Thus, by Stefans's law, each square meter of the Sun's surface radiates energy outward at a rate of (sigma)T^4 = 6.4 x 10^7 W (64 megawatts). By measuring the Sun's angular size and knowing its distance, we can employ simple geometry to determine the solar radius (R = 700000km or 7x10^8m). This allows us to calculate the Sun's total surface area as 4(pi)R^2 = 6.2 x 10^18 m^2. Multiplying by the energy emitted per unit area, we find that the Sun's total energy emission (luminosity) is 4x10^26 W.
One can determine the approximate temperature of a star via its blackbody curve. As an object is heated, the radiation it emits peaks at higher frequencies. TLDR: Basic math will prevent you from looking like a complete fool. In the mean time, please stop dumbing down our country. Adamant wishes this sufferer from Sagan's syndrome a swift recovery. His humor temperature appears to have fallen to levels unseen on the dark side of Eris . One hopes the suggested dimensional analysis will prove therapeutic but the prognosis is grim given the angular diameter of all the red giants within 100 parsecs.